I’ve been waiting a long time for this. For years I’ve been wishing that someone would come up with a fast food restaurant that serves healthy stuff. I’m not the only one, of course. 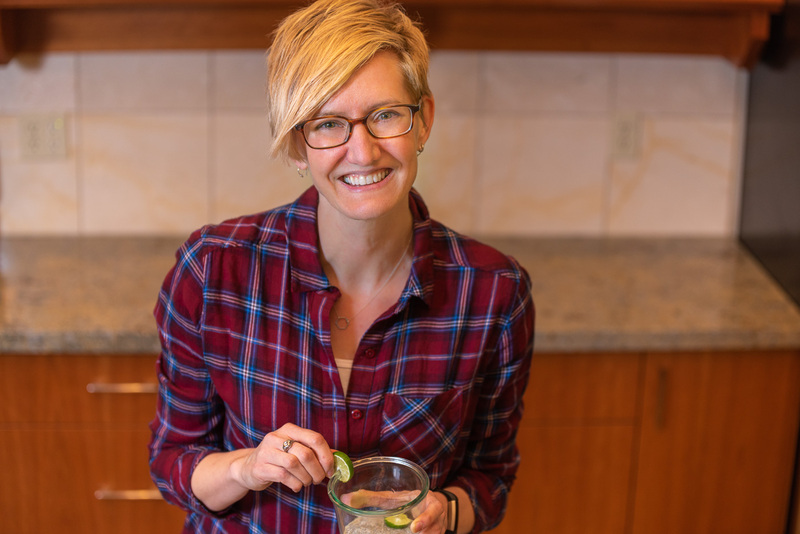 As the connection between diet and disease gained more footing in the health community, more of us started getting hungry for tasty, convenient options that weren’t so closely tied to obesity, heart disease and high blood pressure. But, there was always the argument that when push comes to shove, no one really wants to choose salad over French fries just because they should, which meant no one would buy it. Well, the winds of change must be blowing in the right direction, because I can think of 5 great options for meatless (and mostly healthy) fast food meals, easy. Even food journalist and cookbook master Mark Bittman agrees the time has come. In his recent New York Times article, “Yes, Healthful Fast Food Is Possible. But Edible?” he makes the case that selling this kind of food is now profitable. He thinks “improved fast food” has arrived and “good fast food” is on the horizon. Jeff and I don’t eat fast food a lot; maybe twice a month. But, that’s no reason to throw common sense aside and choose poorly, especially when there are so many delicious options available that don’t make me feel like I’m settling. So, here are my top 5. I should mention that my experience with drive-thrus has mostly been limited to the Pacific Northwest, so you probably have some different chains or local spots to choose from in your neck of the woods. I know, I know, there is a lot of fried food and meat on this menu. But, right alongside it are some pretty great vegetarian items. Nutrition: There are beans on the menu (hooray!) and the option of ordering a whole wheat tortilla. What I Order: Veggie Soft Taco without the ranch dressing or Veggie Fit Hit Bowl with cheddar cheese and a side of chips. And iced tea. Always iced tea. Location: The locations in my state of Washington are apparently affiliated with Taco Time Northwest, which is a spin-off from the big chain with stores in the northern U.S. and Canada, and it looks like there are some menu differences. 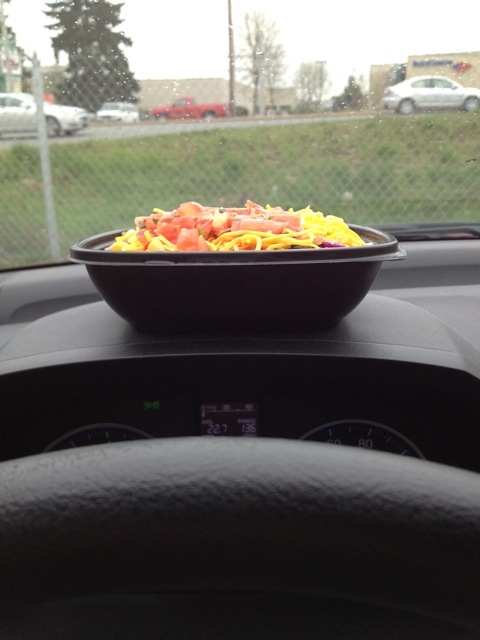 The Fit Hit Bowl takes to the open road. Most places these days offer one requisite veggie burger to appease the meatless among us, but these guys have not one, but two to choose from. I think we’re getting somewhere. Nutrition: The Spicy Anasazi burger is vegan if you order it without mayo or cheese and they offer apple slices or salads as sides instead of fries. What They’re Doing Right: Sourcing many of their ingredients locally, highlighting fresh berries on the menu seasonally, and printing nutrition information right on the receipt. What I Order: Yukon and White Bean Basil Burger without the basil aioli, side salad and iced tea. Location: Burgerville only has locations in Washington and Oregon, but I have hopes that they’ll soon take over the world. I just ate here for the first time last week and I was blown away. They don’t have a drive-thru window, but once I ordered I was out in under 5 minutes flat, so I’d call that fast food for sure. (Before ordering, I first spent a great many minutes staring up at the menu, stalled by indecision.) They originally got started with fresh juices, but have added smoothies and food now as well. 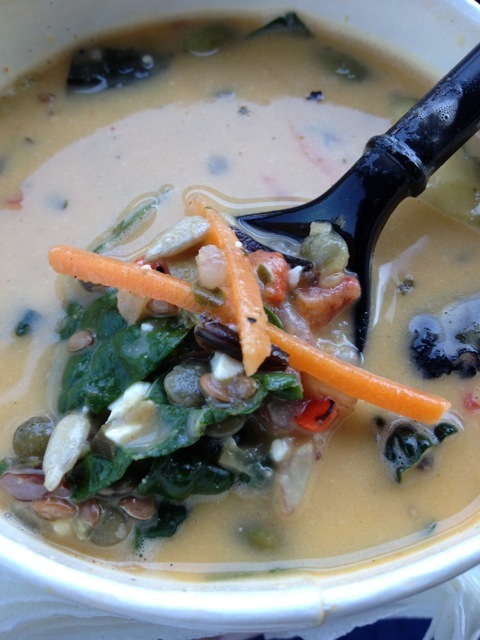 Nutrition: Can you think of any fast food restaurants that have lentils and kale on the menu? Please. What They’re Doing Right: Listing nutrition facts on the menu, using lots of organic produce, and breezily helping their customers meet the recommendation to get 5-9 servings a day of vegetables and fruit. Cost: Pricey. There’s no dollar menu here. This deliciously nutritious menu cost me $21.00. Location: Currently only in Washington (Seattle or Bellevue) and California (San Francisco). I’ll try to drive up demand around here so they can make their way to the other 48 states. My lentils, wild rice and kale were joined by grilled zucchini, peppers, feta, julienned carrots, pumpkin seeds, sunflower seeds, flax seeds, and fresh herbs. 2. Your Local Burger Joint. Sometimes it pays to look close to home for the real food innovations, instead of waiting for the big chains to figure it out. Our local spot, Fiamma Burger, is a gem. Nutrition: They offer fresh made whole wheat buns and make their own veggie burgers from scratch with rice, oats and soybeans. What They’re Doing Right: Making their own vegetarian chili from scratch and offering any of their burgers served on a bed of organic greens instead of a bun. 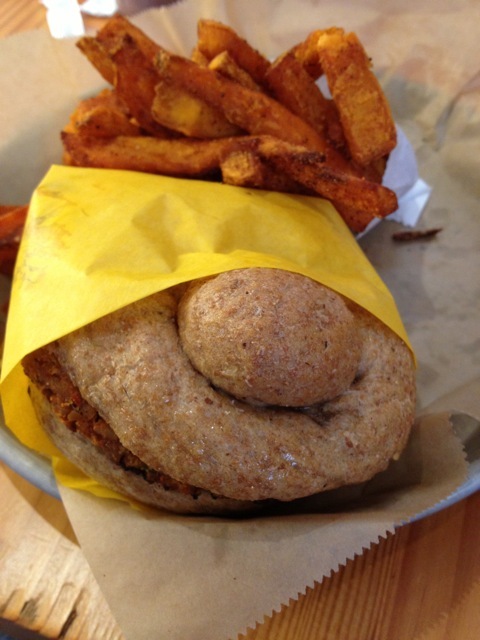 What I Order: Veggie Burger with cheddar-jack on a whole wheat bun, sweet potato fries, and unsweetened iced tea. Location: Lucky for me, they’re just a few miles away in downtown Bellingham. Check out your city or town to see if there’s a local business to support, especially if they’re supporting their community by offering healthy choices. The sweet potato fries are dusted with chili lime spice. And look how cute the homemade bun is! What They’re Doing Right: Printing calories on the menu board, letting customers customize their order by building one item at a time, and sourcing organic and local produce when possible. Location: Basically everywhere. And Canada. UPDATE August 2013: They’ve now added tofu to the menu in select locations! Starbucks should probably get a mention here too, as we often enjoy their Protein or Cheese and Fruit Bistro Boxes, along with Subway and their Veggie Delite sandwiches. If you start looking, there are actually quite a few options out there. That means I hope to expand this top 5 to a top 10 in the future and one possible contender is Veggie Grill, a vegan premium fast casual chain that just moved into my state. I don’t want to speak too soon, but I think the wait for healthy fast food might be over. Want more? I did get around to updating this list in 2015 and added 6 more favorite spots for veg-heads, including Veggie Grill. Check it out here. Where do you find yourself grabbing a quick and healthy bite when you’re in a hurry? 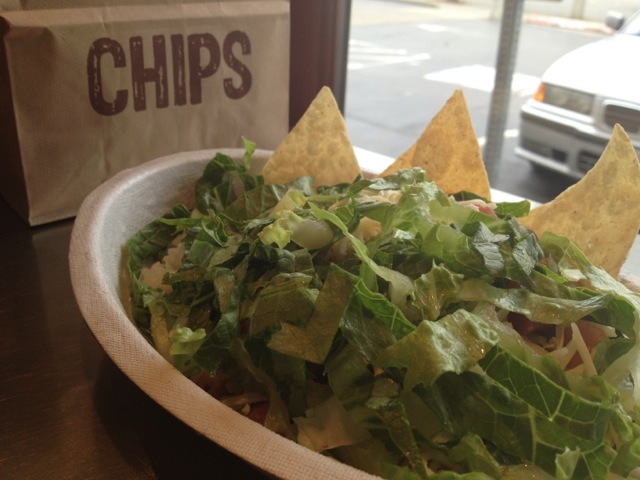 Kristine- Where is the nearest Chipolte Mexican Grill Restaurant to us here in Bellingham? I don’t think I’ve ever visited this restaurant, but would like to. To the north, Vancouver BC. To the south, Lynnwood. I think you’d like it! 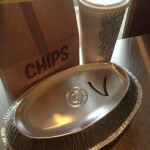 Chipotle is awesome – love their kid’s options too (build-your-own taco box!). Couldn’t agree more. They’re both good choices, I think. I don’t know about the build-your-own taco box…that makes it kind of fun and lets kids make it how they like it. Cool. Chipolte is testing out tofu in some CA locations. Let’s encourage them to expand to WA and OR! That is so great! I totally agree. Washington and Oregon should be next on their list. Either that or I’m going to have to plan a little road trip. Got any more tips for National chains with vegetarian options? Taco Bell- sub beans for beef on anything! TIP: Stop at a grocery store and grab a bag of salad that’s ready to mix up. You can grab a fork by their deli counter! McDonald’s, Arby’s, Checker’s/Rally’s have fried fish sandwiches if you eat fish! Hi Kristen with a K! I follow pretty much the same suggestions you listed when I visit national chains. I’m also a big fan of the Happy Cow website and app (http://www.happycow.net/) that list vegetarian, vegetarian-friendly, and vegan restaurants. You can use the Search Nearby function if you have GPS on your phone or search by address/zip code. If I’m in an unfamiliar city, I almost always find something unexpected and am so grateful. I think Wendy’s has some salads that you can order without the chicken, or a broccoli and cheese baked potato. Vegetarian pizza is usually available if you can find a Pizza Hut, Dominos, etc. Hot dog shops are kind of popular in Seattle these days, and most all of them offer some version of a veggie dog. Thanks for your helpful ideas. Subway: Veggie patty sandwich (aka “veggie max”) adds some protein and tastes similar to a veggie burger patty. I don’t think it’s vegan, though. Quizno’s: Haven’t been in a while, but they have a caprese sandwich and a veggie sandwich. You could omit the cheese in the veggie sandwich to make it vegan, though even with the cheese it’s not super filling, in my experience. Great ideas, Roxanne. It does seem like most places have at least one menu item that can be modified to be meat free and still yummy. Thanks so much for sharing. That is a great tip – World Wrapps is really yummy. (I’m betting they marinate and grill their own tofu, too?) Thankfully, there are so many options out there now, we have likely all found a few favorites. World Wrapps should definitely go on my next list. Chipotle’s pinto beans no longer contain bacon, and they are now vegan. I don’t eat at most fast food places. Almost all of them touch the non-veg items to the veg items with their hands( subway is the worst) or utensils(cutting things with the same knife or touching the spoon to the meat and then my food). Burger places that grill veg burgers usually grill them next to the meat burgers. Oil for veg items sometimes is the same oil used for cooking meat items.Taco bell has lard in their beans and used to in their tortillas.Most places don’t use vegetarian cheese(such as Tillamook). I guess I am very particular, but have been a vegetarian for 33 years and take it seriously. I have often thought of opening a true veg fast food restaurant. I think there is a market for it now. You’re right, Marie. It is certainly an imperfect system at this point. And, NOT eating at fast food is a smart dietary choice. And I agree that there might be a market for a vegetarian fast food restaurant now. This article by Mark Bittman might inspire you to open your own! Taco Bell actually does not have lard in their beans. They used to, but no longer. Thanks for the update, Roxanne. I know Chipotle took the bacon out of their pinto beans, too. Sounds like we’re moving in the right direction. required then a adrenaline mightn’t possess the same influence.